February 2014 | La-med Healthcare Pvt. Ltd.
- Radio opaque catheter for easy insertion, bio compatibility and X ray detection. - Body with suture hole wings for easy fixation. - Broad tyvek blister packing. 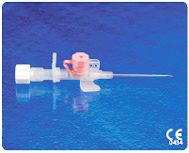 - Flexible angled and grooved wings allows easy fixation and prevent displacement of cannula over the patient’s body.